Mildred Martin, 71 of Louisville passed away Tuesday, March 18 at the Hosparus Inpatient Care Center. She was born in Johnson County, IN to the late Joseph Logsdon & Versie Patterson Logsdon. Mrs. Martin was a homemaker and a member of the Fairdale Christian Church. 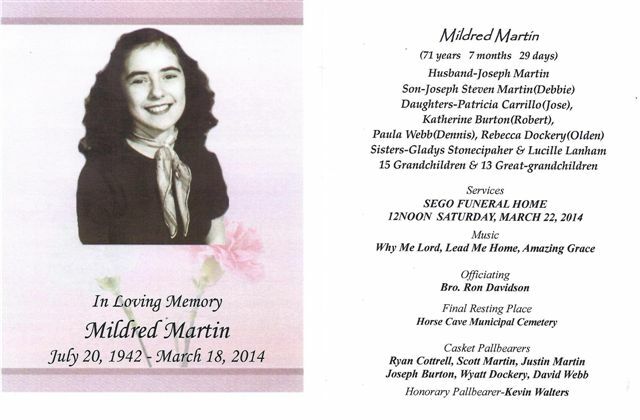 Funeral services for Mildred Martin will be 12noon CST Saturday in the chapel of Sego Funeral Home with burial in the Horse Cave Municipal Cemetery. Visitation will be Friday from 2-8pm CST and after 8am Saturday at the Sego Funeral Home.